Dumbo (Buena Vista, R-1972). Poster (40" X 60"). Animation. Starring the voices of John McLeish, Herman Bing, Edward Brophy, Margaret Wright, Sterling Holloway, Cliff Edwards, and Verna Felton. Directed by Ben Sharpsteen. A Walt Disney production. 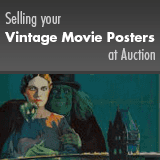 An unrestored 40" X 60" poster with good color and an overall very presentable appearance. It may have tears, corner bends, creases, smudges, minor stains, and/or some edge wear. There is a six inch tear in the lower border. Please see full-color, enlargeable image below for more details. Rolled, Fine+.